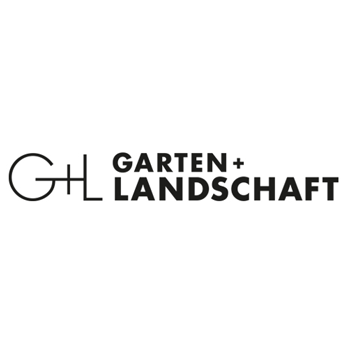 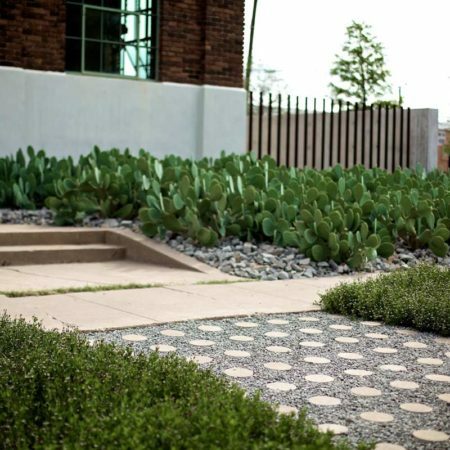 Hocker Design Group (HDG) is an internationally-recognized, award-winning landscape architecture studio based in Dallas, Texas. 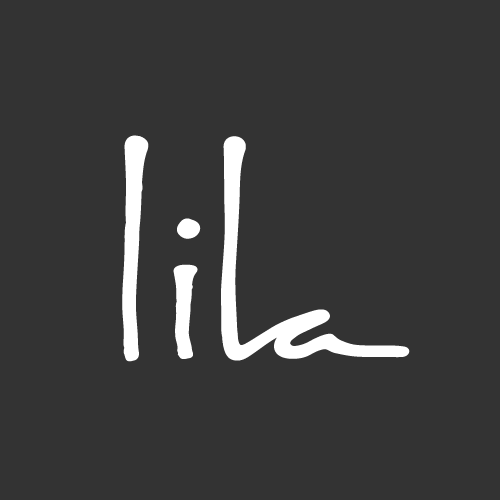 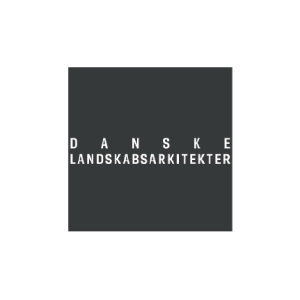 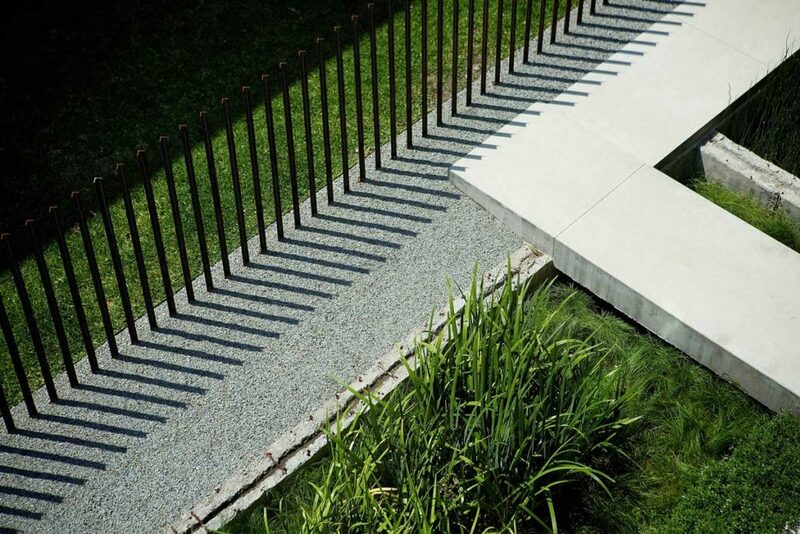 It was founded in 2005 by President, Founding Partner, and Design Principal David Lennox Hocker. 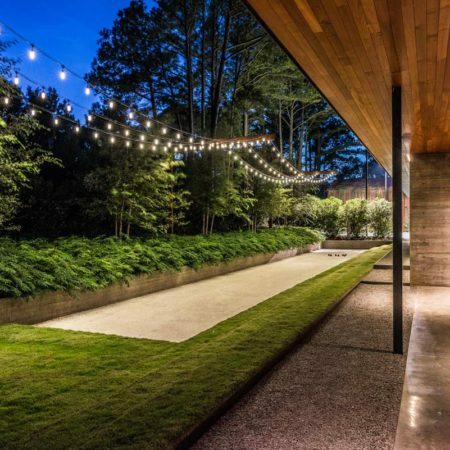 Since its inception, the firm has been awarded over 30 design awards, including 4 American Society of Landscape Architects (ASLA) and 24 Texas ASLA awards. 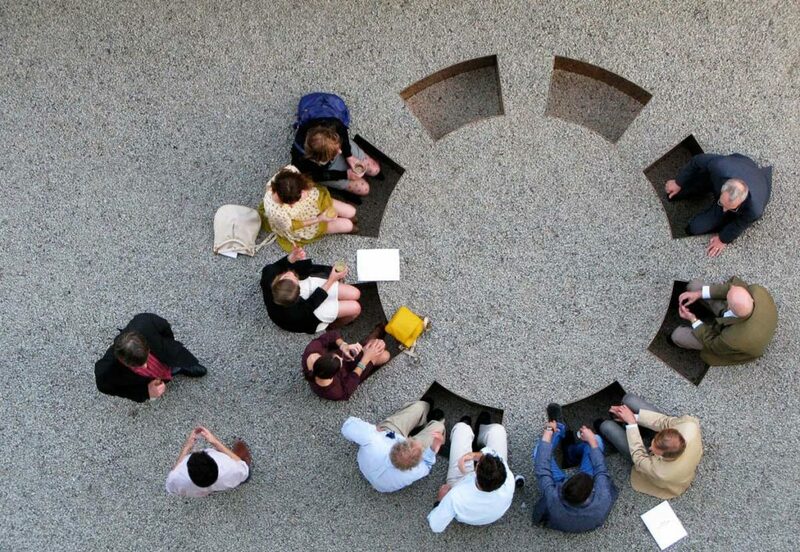 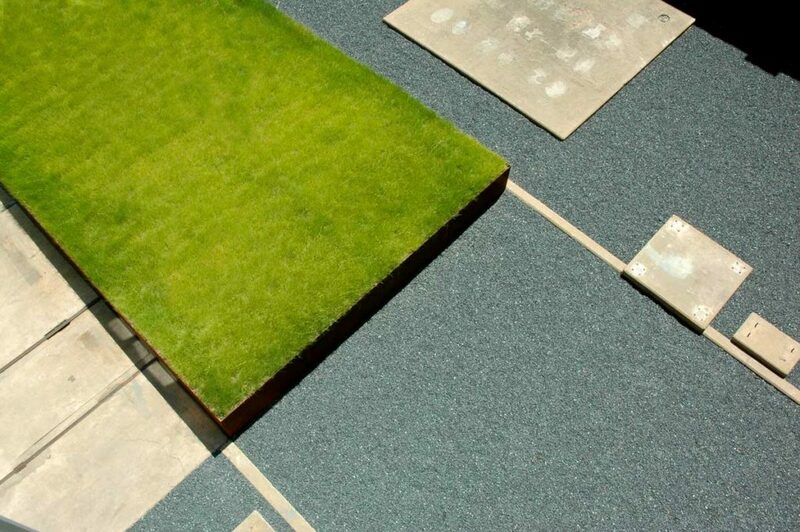 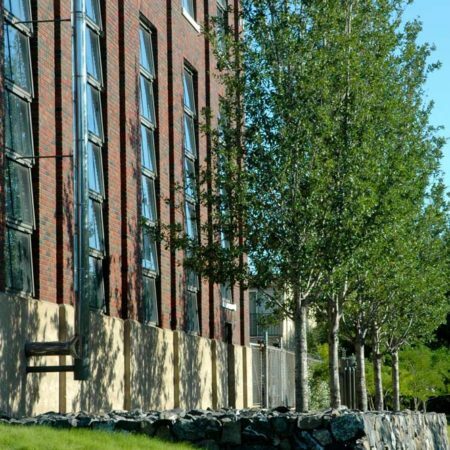 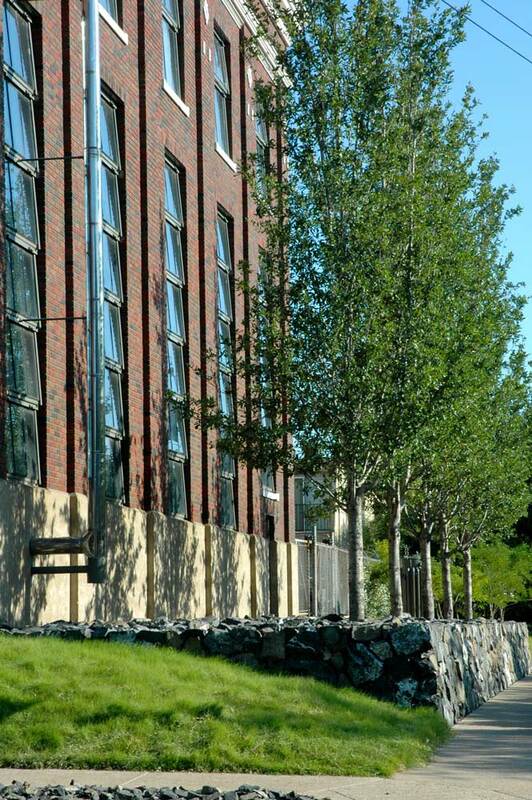 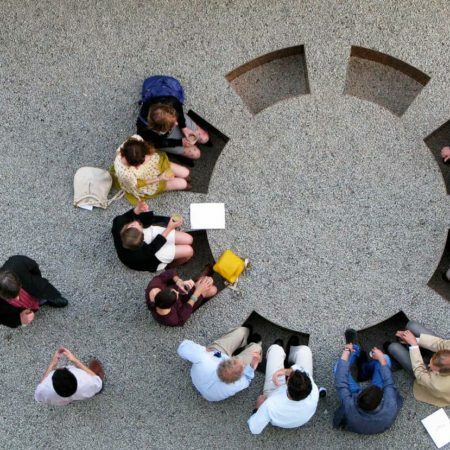 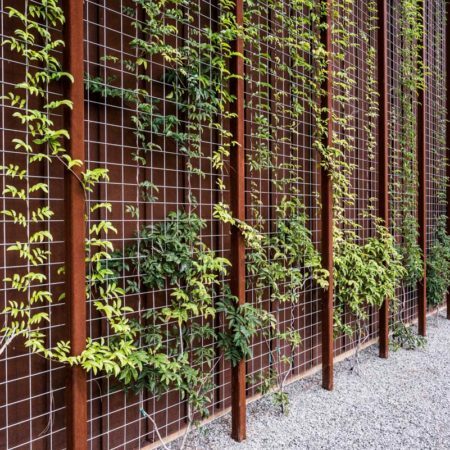 HDG responds to unique design challenges with responsible, innovative solutions that are appropriate for each site’s ecology and client’s programmatic requirements. 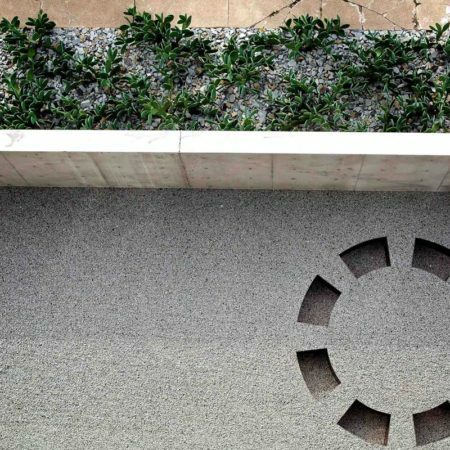 At the very core of the firm’s work is a mission to establish the landscape as a cohesive link between a project’s architecture and site. 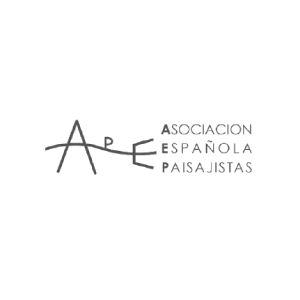 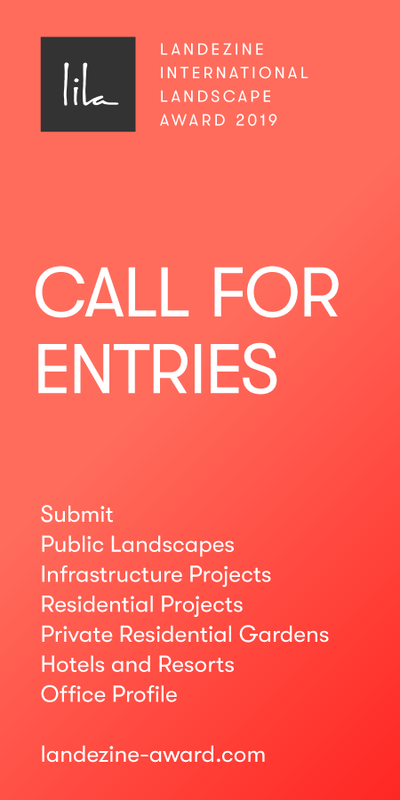 The awards serve as validation of these efforts. 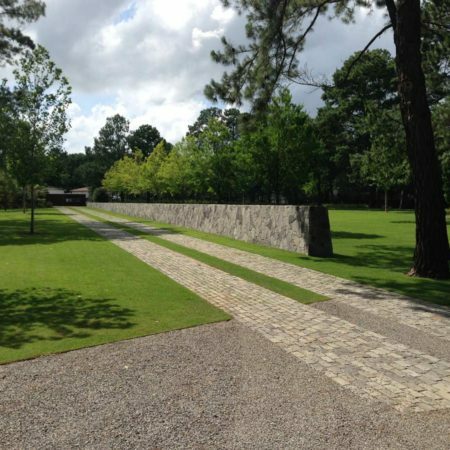 Texas and surrounding regions provide HDG with endless exposure to a diverse mix of urban, rural and agricultural landscape patterns. 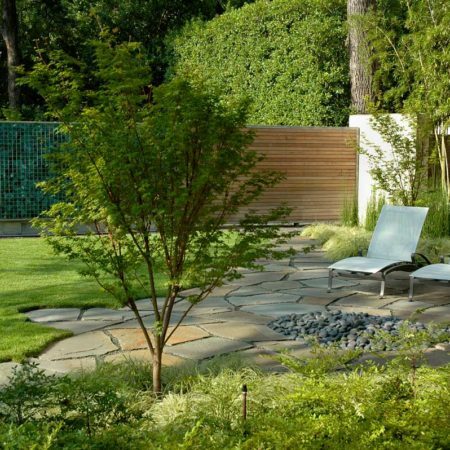 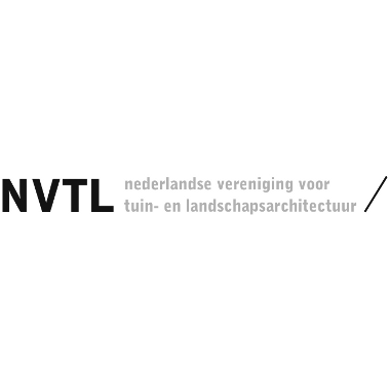 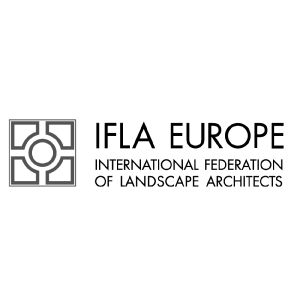 Intimate knowledge of these native landscapes is integral to the design process, as it applies to a variety of projects ranging from residential gardens, to parks and urban design. 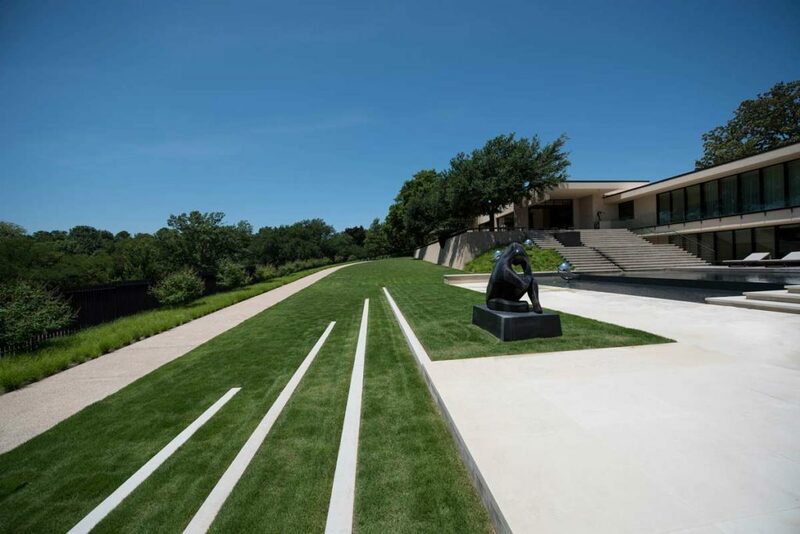 Hocker’s personal travel in and extensive ties to Italy further inform the design principal’s basic understanding of landscape architecture, and these influences are revealed in every project. 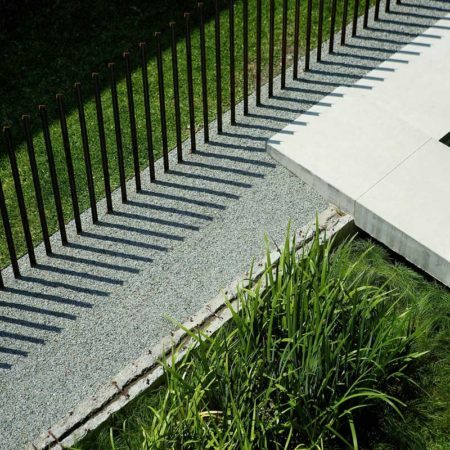 HDG’s designed spaces are meticulously detailed and reflect a strong material comprehension relative to site and context. 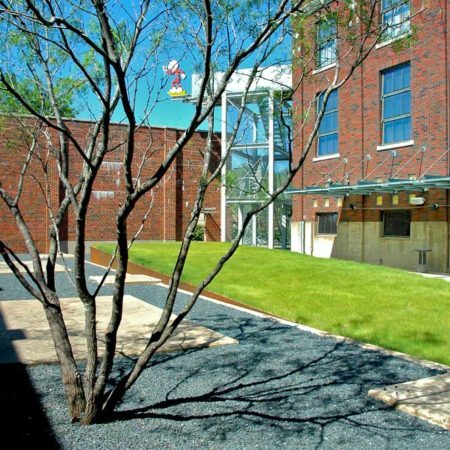 The built work of HDG includes institutional, corporate, mixed-use, and residential projects across North America and soon abroad, and the firm’s landscape architects hold current registrations in Texas, Oklahoma, and California. 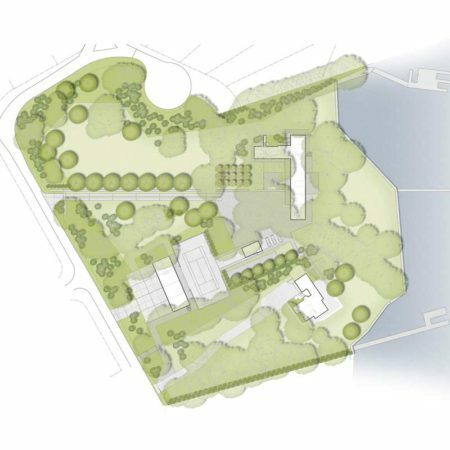 Regardless of typology or location HDG approaches each project’s unique characteristics with openness to collaboration and design exploration with the project team. 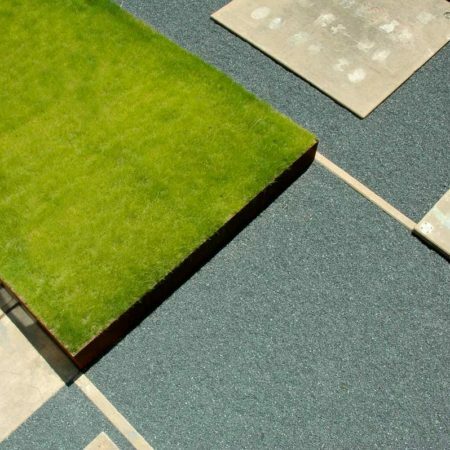 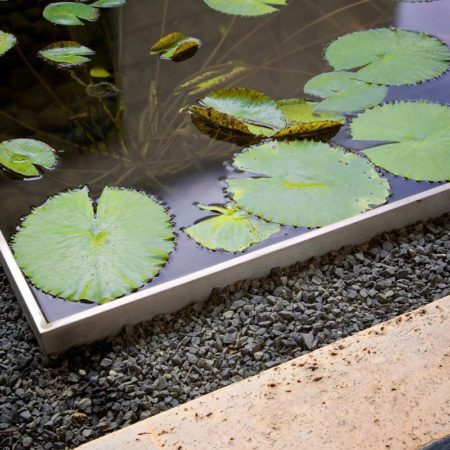 The resulting work is anchored in connectivity to a region’s ecology, natural geographic features, strong programmatic development, and an overarching desire to create beautiful, simple spaces that exhibit the art of restraint. 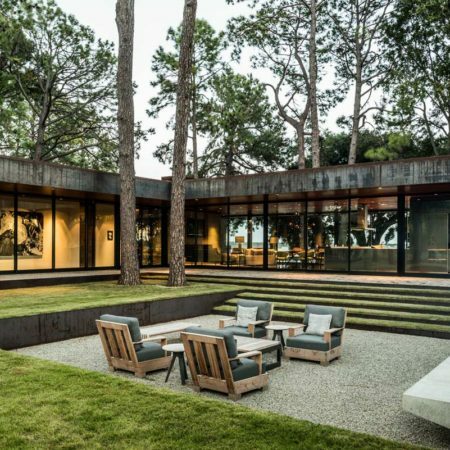 Set in a wooded, 7-acre site above Cedar Creek Lake, this series of buildings are weaved discreetly below the tree line, taking advantage of commanding views of the surrounding lake. 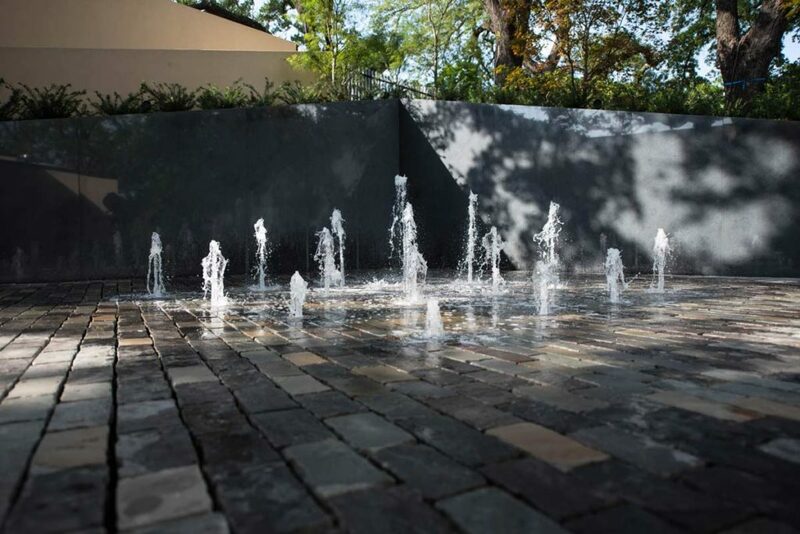 Close collaboration between design team and client transformed a long-held family property into a legacy destination where the harmony between built structure and site results in a completed project that feels as if it has been in situ for years. 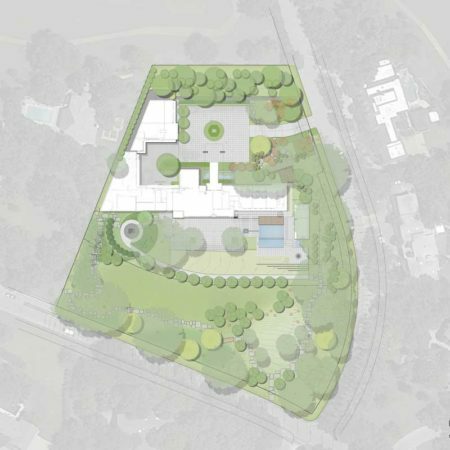 The master plan sited the house, pavilion, tennis court, and garage barn amongst a high canopy of existing loblolly pine and live oak trees. 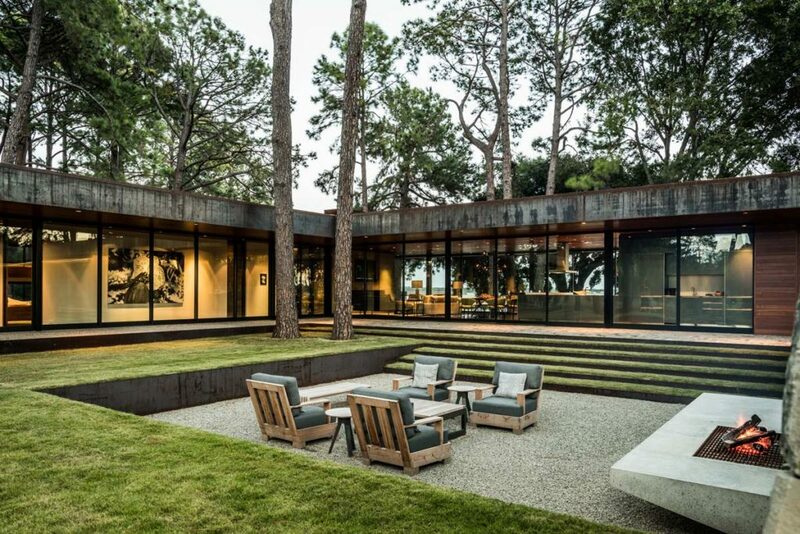 The primary residence is carefully slipped into a tall tree grove, establishing a dual paradigm of minimizing tree loss and maximizing views to the lake beyond. 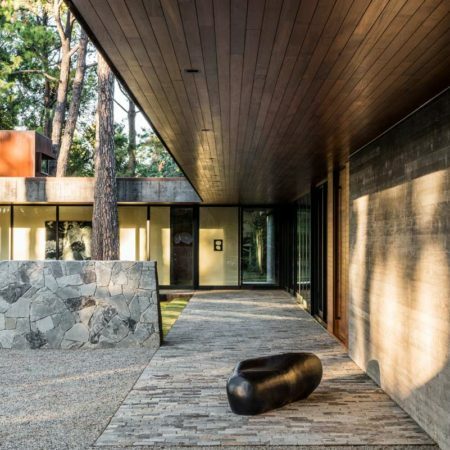 A simple and restrained materials palette of wood, stone, concrete, and weathered steel are used throughout the project, reflecting the native environment. 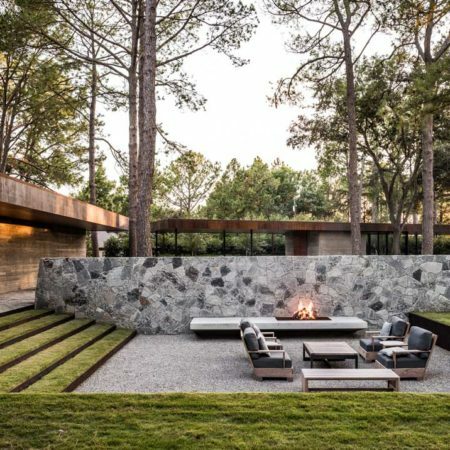 As a battered stone wall and driveway approach the residence, the wall’s function shifts to the opposing side where it creates a backdrop for a sunken private outdoor living room. 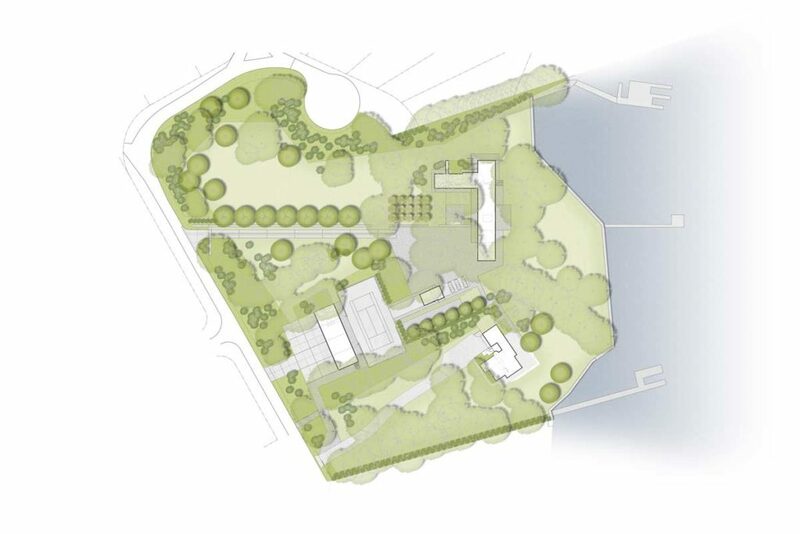 The gravel motor court opposite this space is defined on its far side by a pavilion that serves as both a carport and guest quarters. 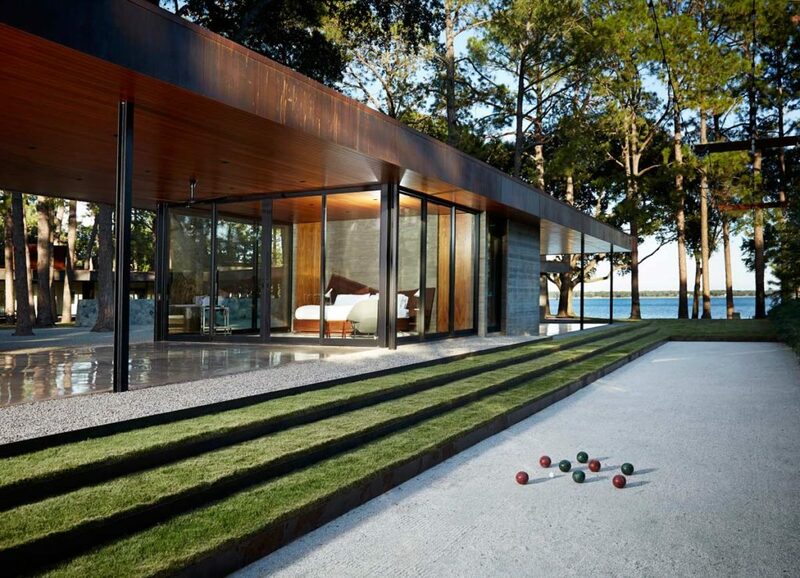 Fronting the pavilion’s far side, a bocce court cuts into the grade toward the tennis court. 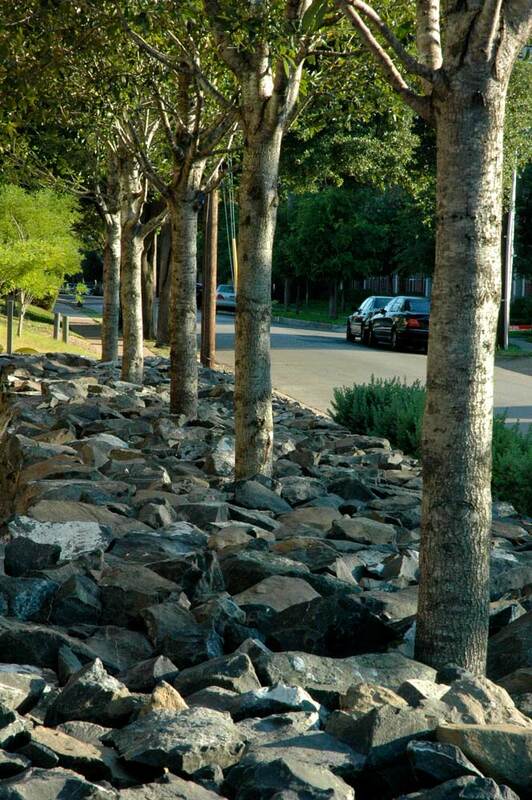 Native plantings and partial reforestation of native trees throughout existing and re-designed spaces further enhance the site and ensure its qualities and health for generations to come. 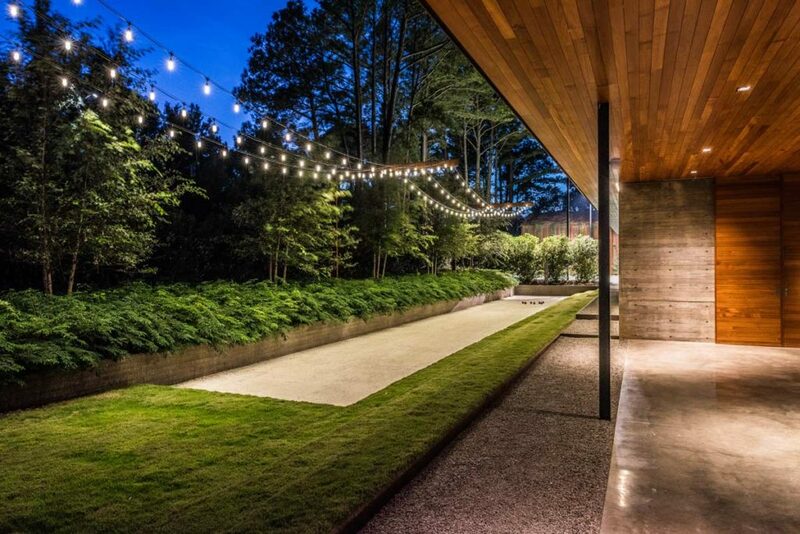 A House in a Garden originally served as an urban retreat for an artist and car enthusiast who lived next door. 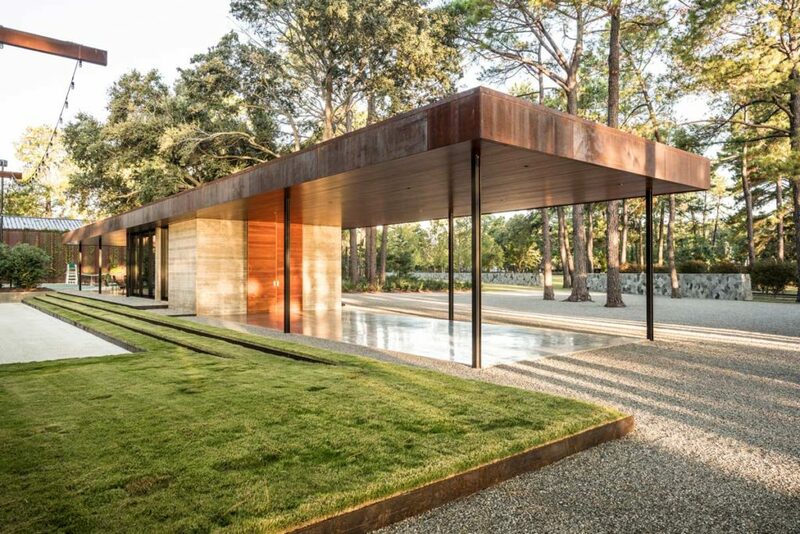 History separated the pool house from the adjacent house, and the original owner, now an empty-nester, transformed the property into a residential domain. 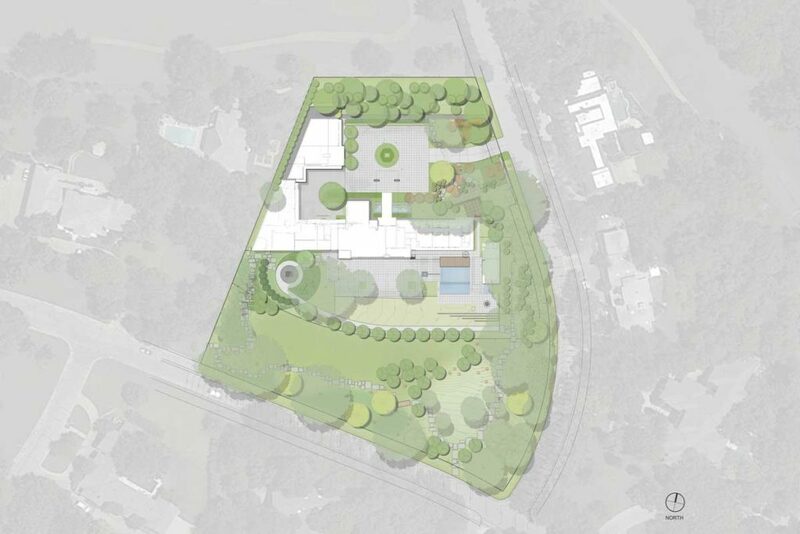 The small house functions as the center for family and social gatherings during holidays and times of reunion. 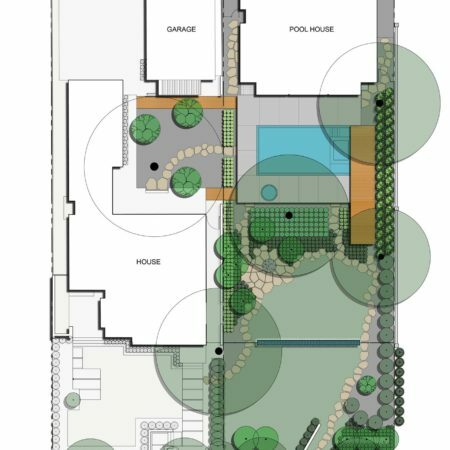 It successfully accommodates varying sized groups, tucked discreetly towards the rear of the site, through a series of transitional garden spaces. 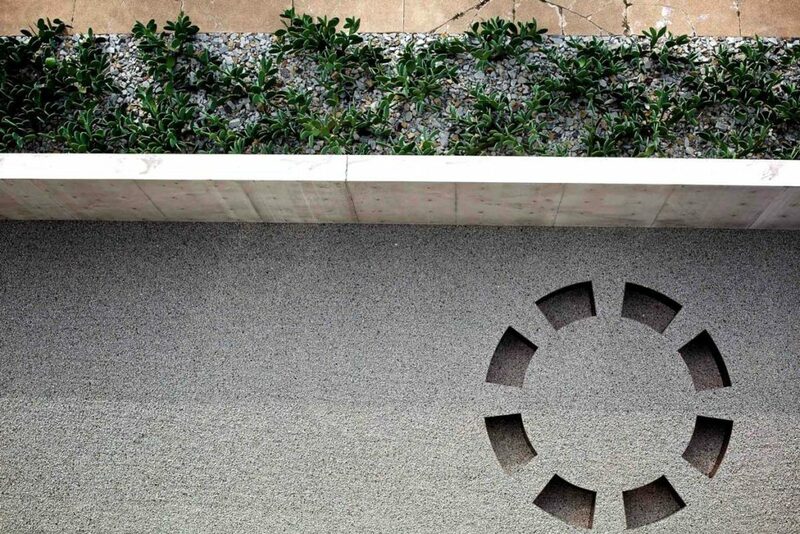 A great amount of collaborative thought was incorporated into every design detail throughout the entire process. 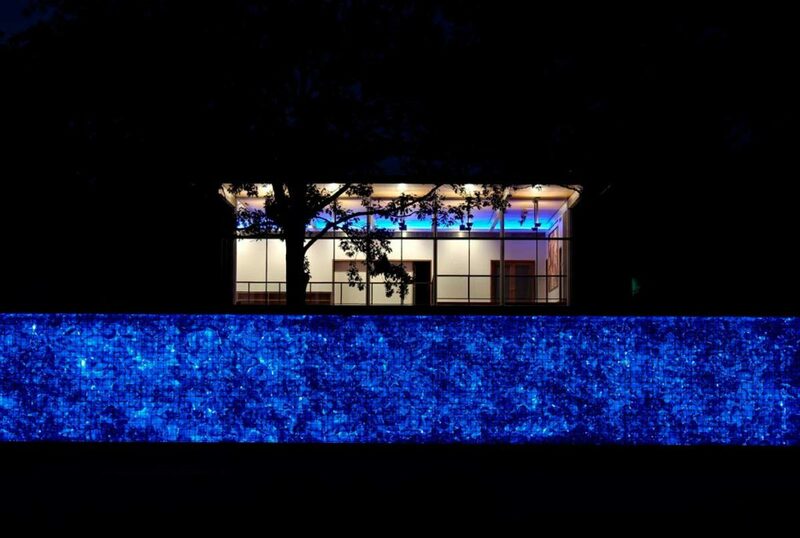 The central spine of the site is a 6-foot privacy wall, comprised of a stainless steel cage filled with blue recycled glass slag. 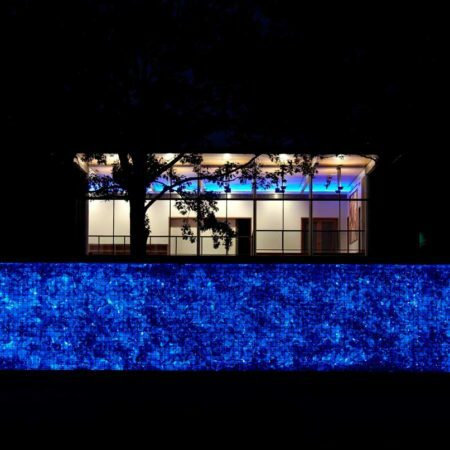 This element is lit from within, and emits a smoldering blue glow at night. 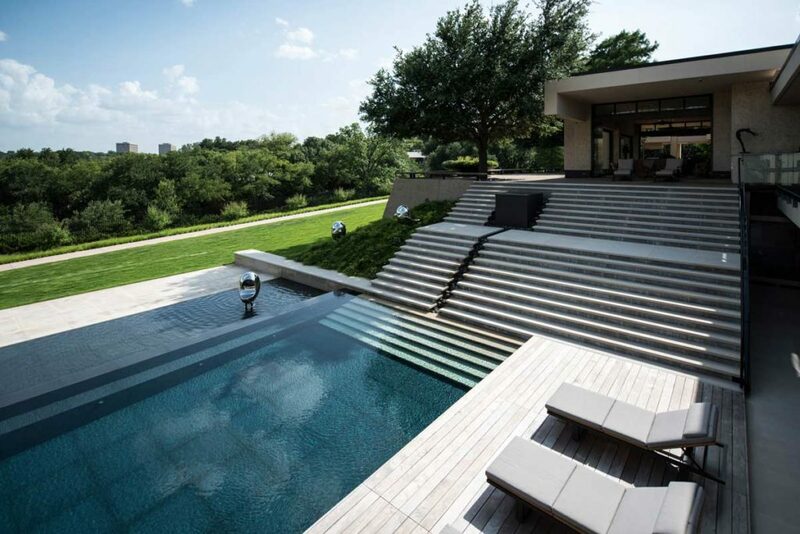 Seamless transition between interior and exterior spaces was extremely important; the interior concrete floor extends outward, embracing the swimming pool that hovers 1-inch above the concrete deck with an infinity perimeter edge. 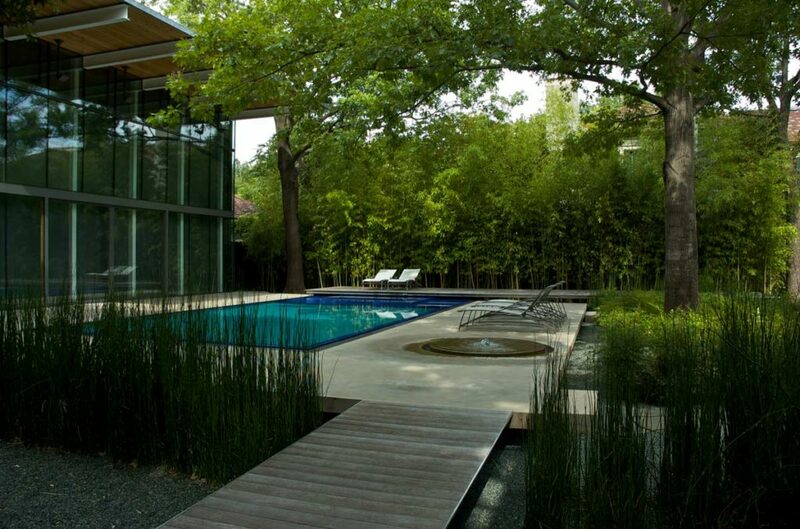 An ipe sunning deck extends out over the pool into the garden beyond, extending the materiality of the house. 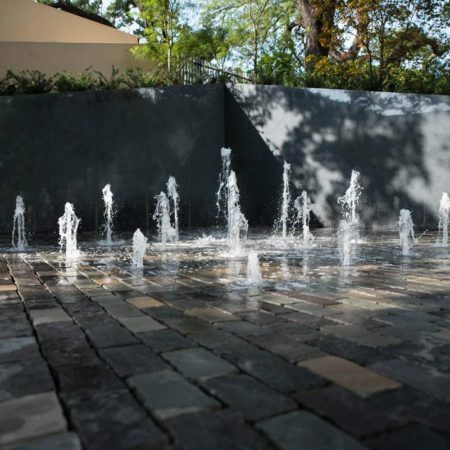 A small integral water feature provides subtle noise, and stone slabs become “connectors” throughout the site, providing transition from space to space. 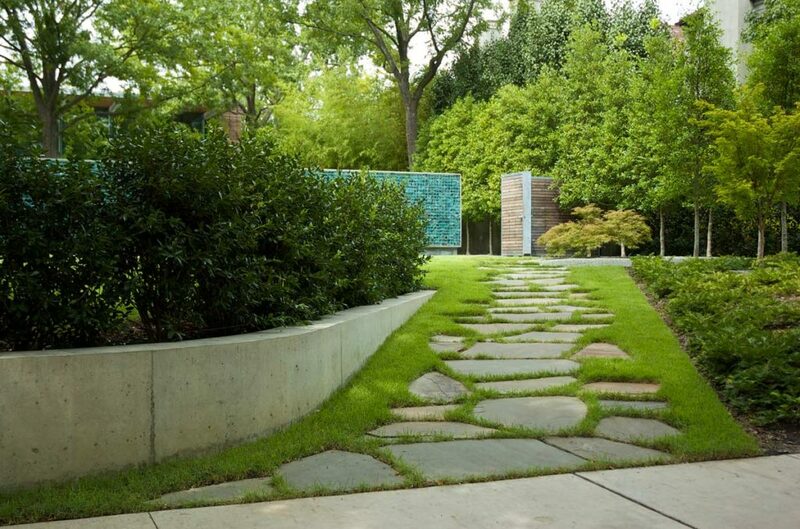 These sinuous pathways culminate, encircling a fire pit. 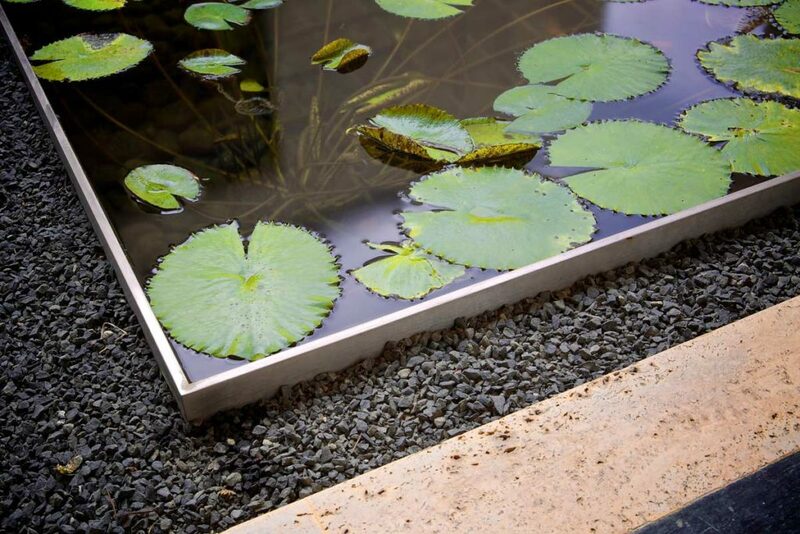 A minimal plant palette is massed for textural impact and privacy screening. 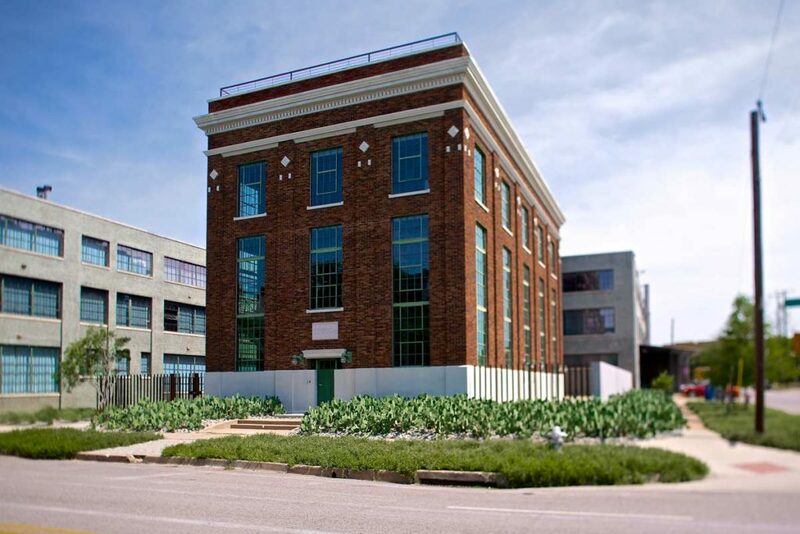 After sitting vacant and inoperable for twenty years in a mixed residential and commercial area of Dallas, this 1923 Dallas Power and Light Company electrical substation was transformed into a single-family residence. 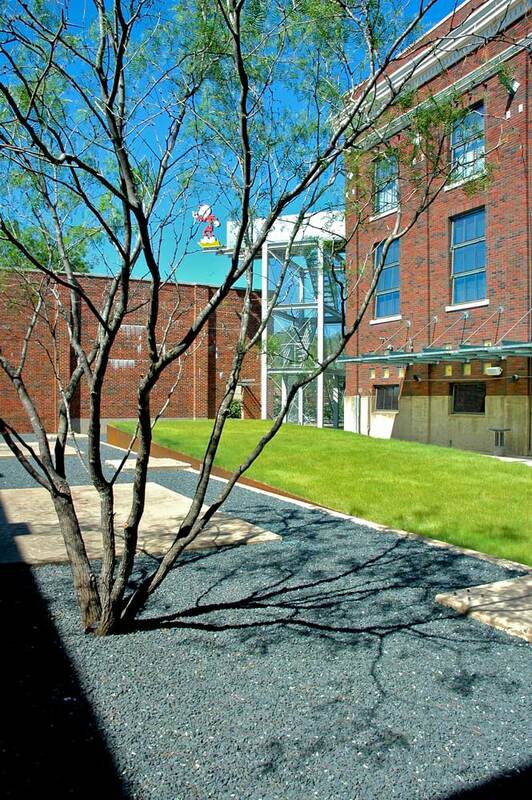 The exterior is an urban experience located near the Katy (hike and bike) Trail. 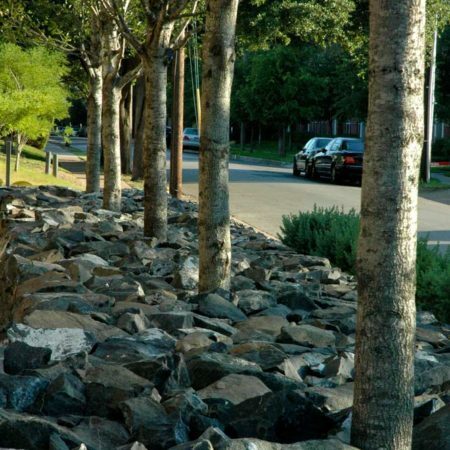 Native buffalo grass, wildflowers and groves of Eve’s necklace trees soften the ground plane while creating seasonal interest and minimizing water consumption and maintenance. 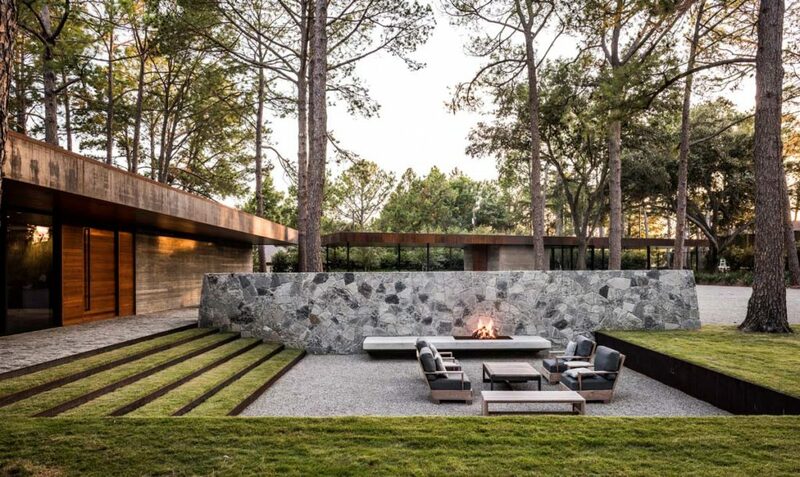 Along the western edge a raised basalt boulder plinth provides an urban edge where High Rise live oaks emerge to create shade for the three-story glazing of the residence. 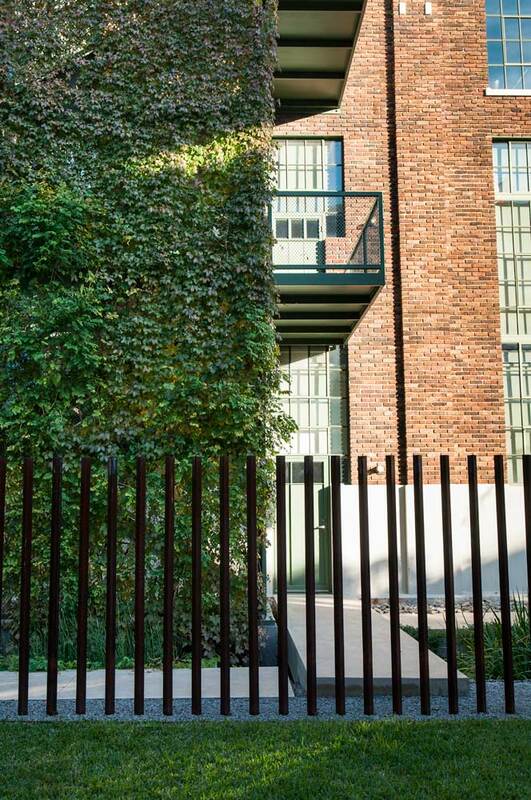 Inside the compound a motor court is enclosed with a living green screen providing privacy. 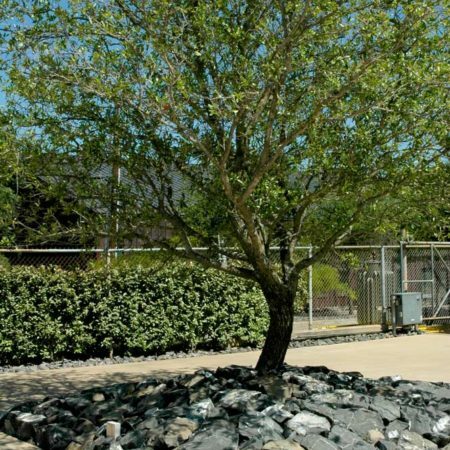 Upon entering the motor court, a windswept native live oak becomes living sculpture, rising out of a fitted boulder mound and providing relief from the intense sun. 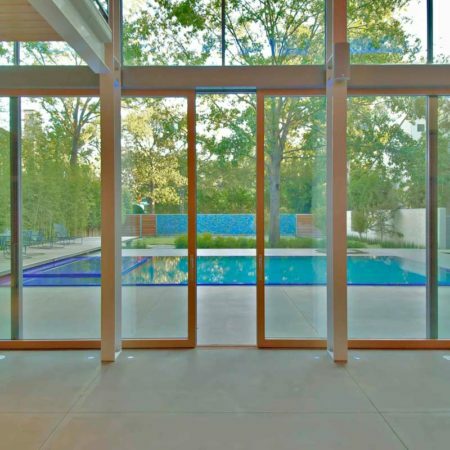 A living green screen encloses the private space. 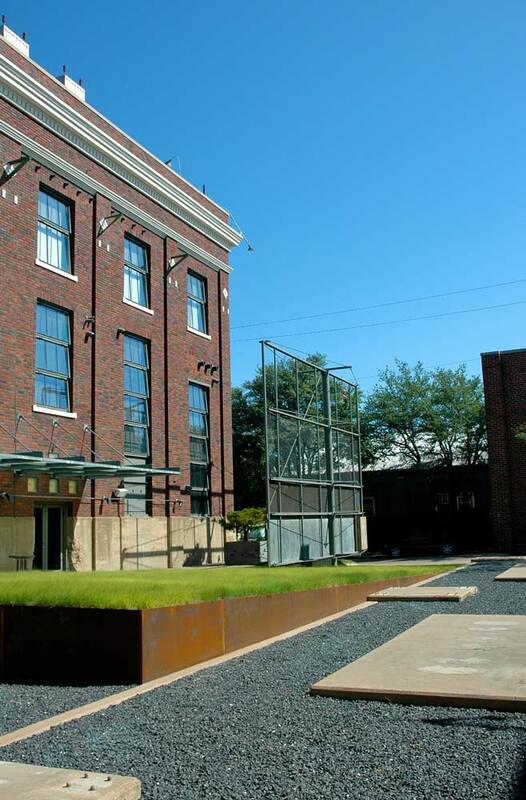 The main courtyard is surrounded by an existing brick wall. 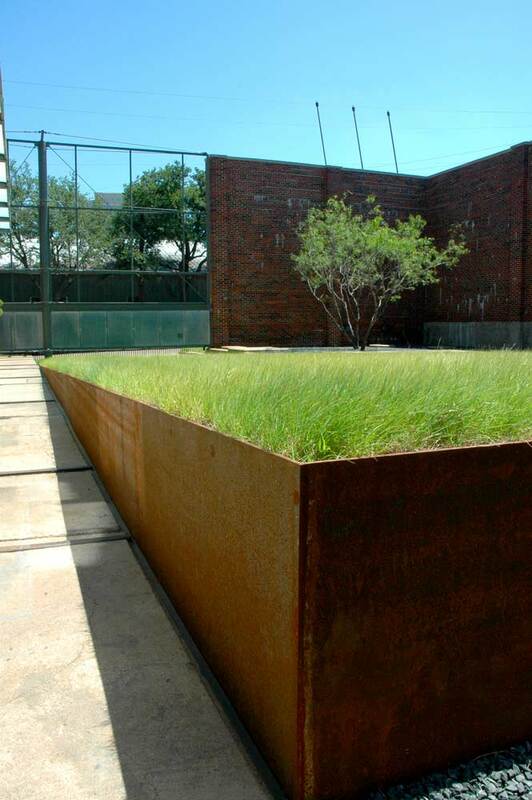 The existing concrete transformer and equipment pads are preserved and incorporated into the design. 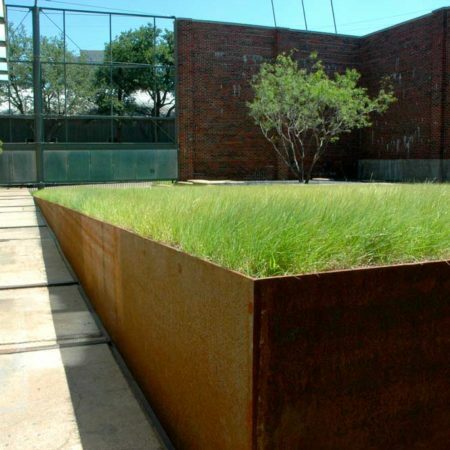 The north steel pivot gate opens to reveal a tilted plinth of flowing buffalo grass, held by an erupting steel plinth that creates a sense of upheaval. 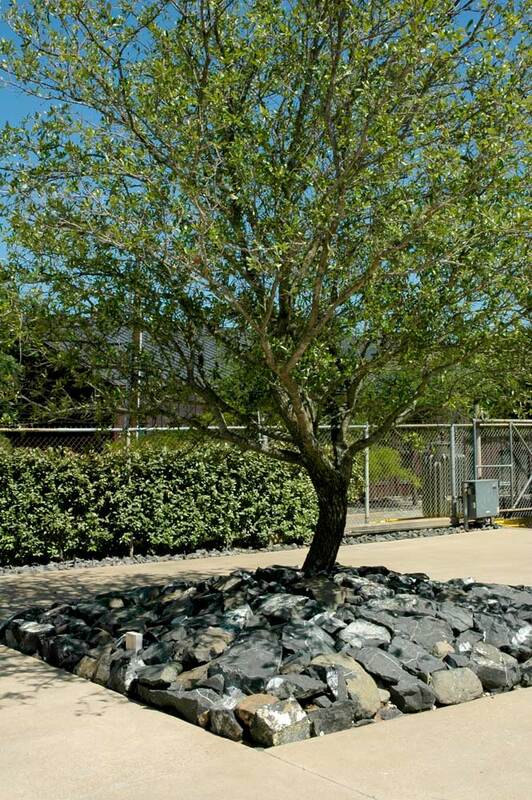 A lone mesquite tree is a living sculpture surrounded by basalt gravel, its shadows gracing the ground. 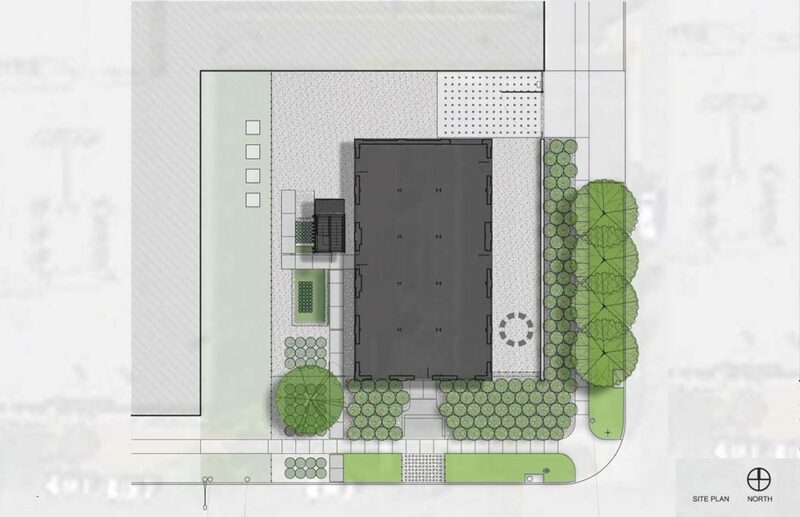 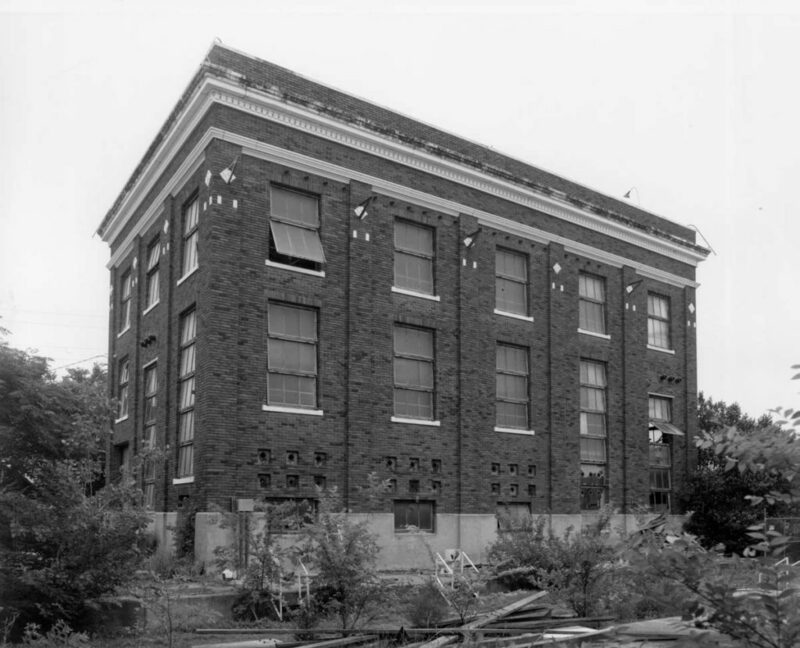 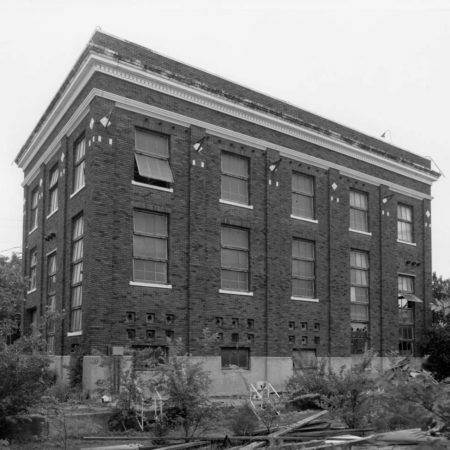 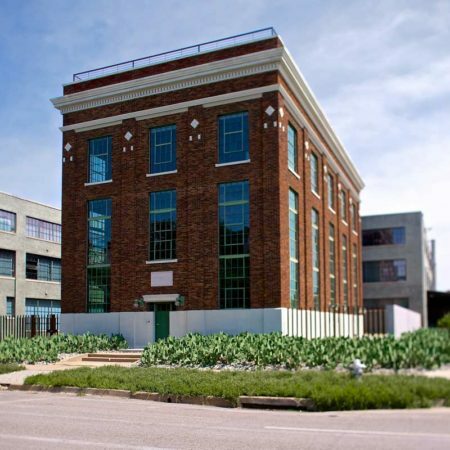 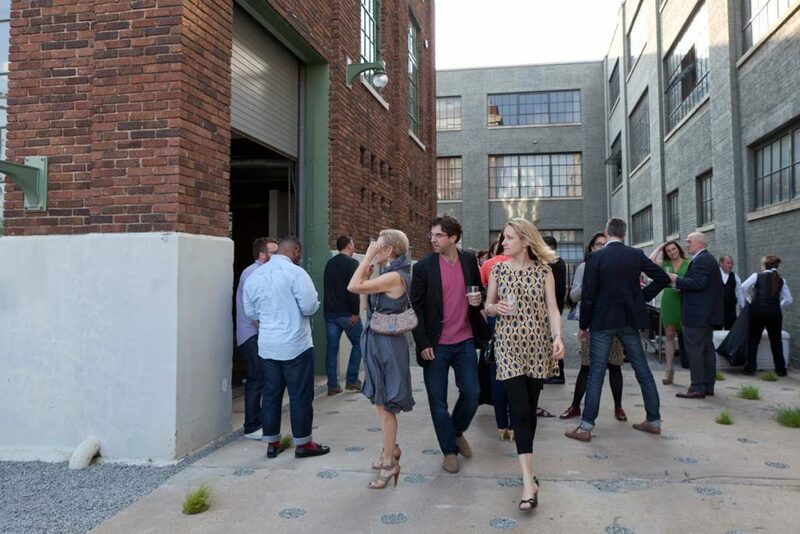 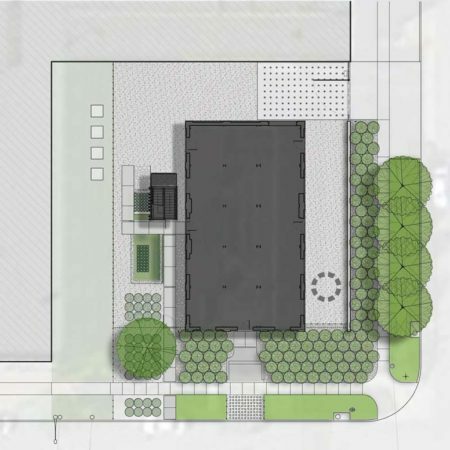 The Power Station is an indoor/outdoor art exhibition space, guest artist’s residence, and not-for-profit organization that invites artists to respond to the raw character of the architecture, a 1926 Dallas Power & Light electrical substation. 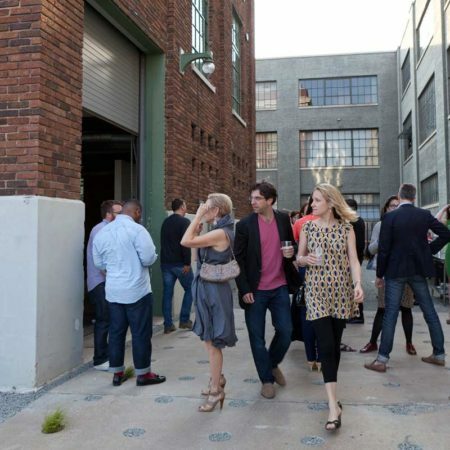 The post-industrial spaces offer an alternative to the traditional gallery or museum context. 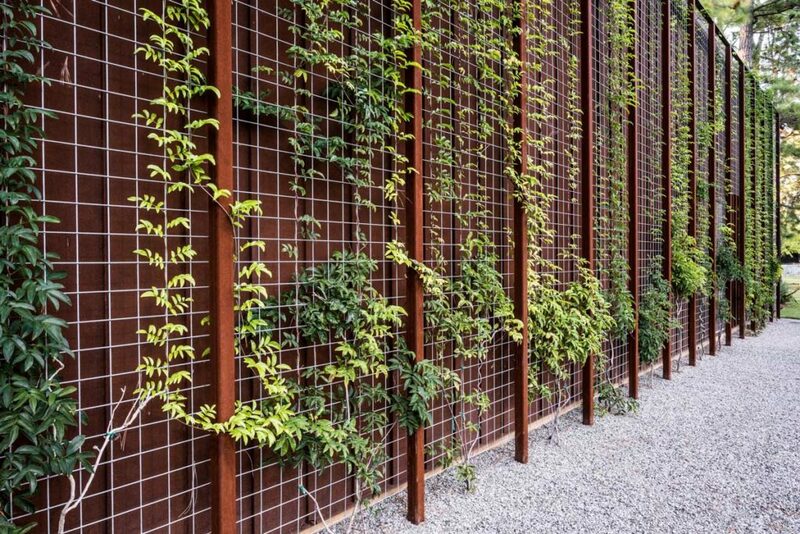 Here an urban garden gallery has sprung to life within the former industrial compound. 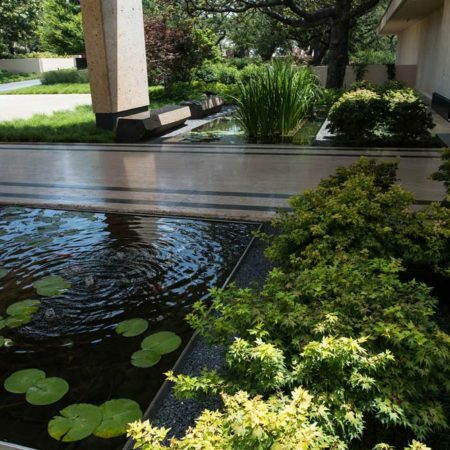 Much of the garden’s design originated from interior views into the garden. 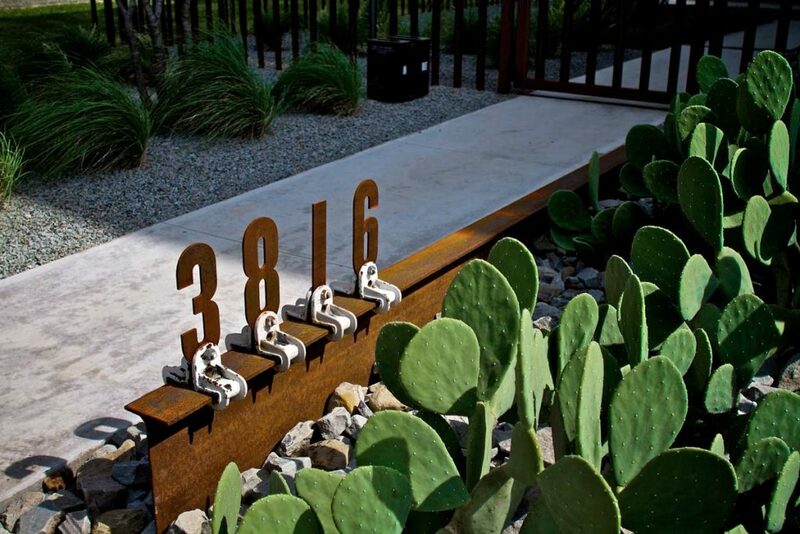 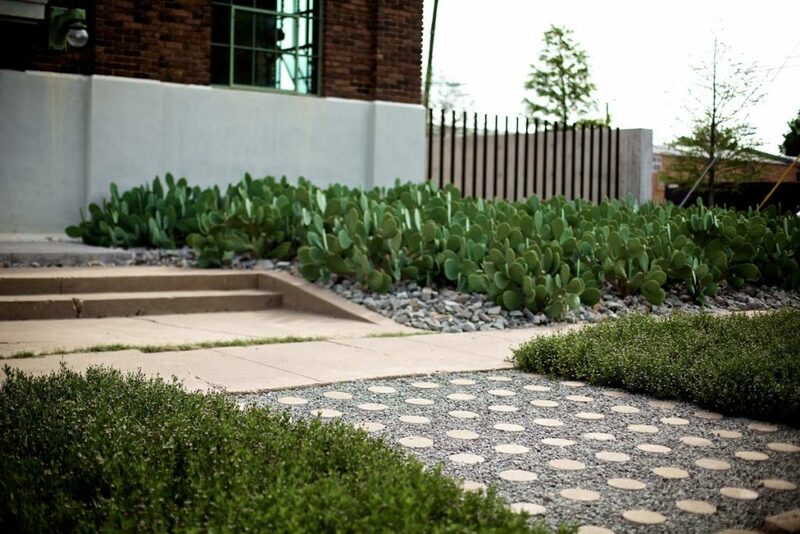 Juxtaposed with the historic architectural details of the substation, the garden’s aesthetic incorporates simple modern element constructed from a restrained materials palette of crushed aggregate and rip rap, architectural and recycled concrete, steel, and native plantings. 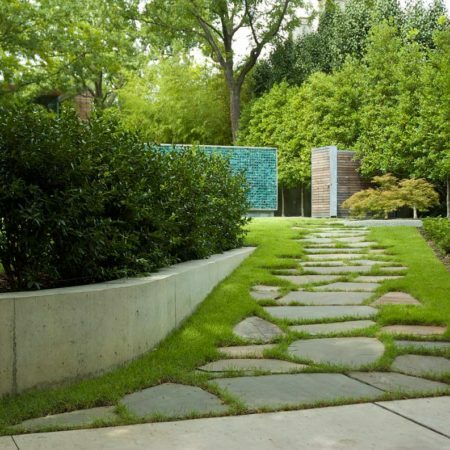 The continual patination of these materials ties aging but timeless architecture to garden in a complimentary fashion. 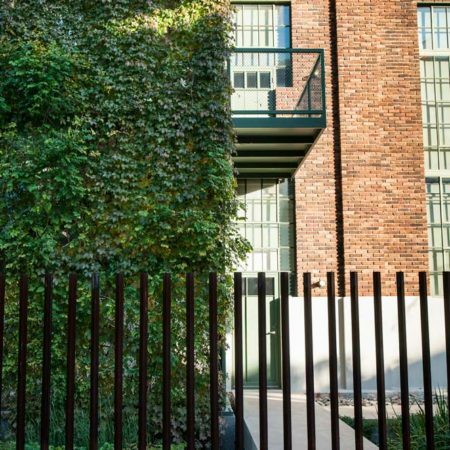 This small contemporary urban garden healed-back a former industrial site, and had simple program requirements of privacy and usability. 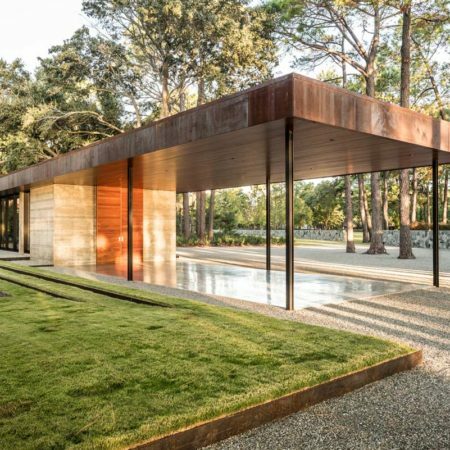 The building and garden relate to one another gently through the careful manipulation of crisp architectural elements that are then intentionally eroded by more informal, lush plant material. 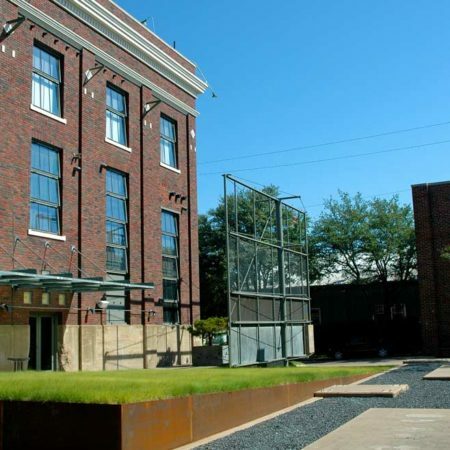 In Dallas where new construction is typically preferred, this project is a welcomed reminder that a thoughtful renovation of historical building and site can generate spaces that provide both form and function. 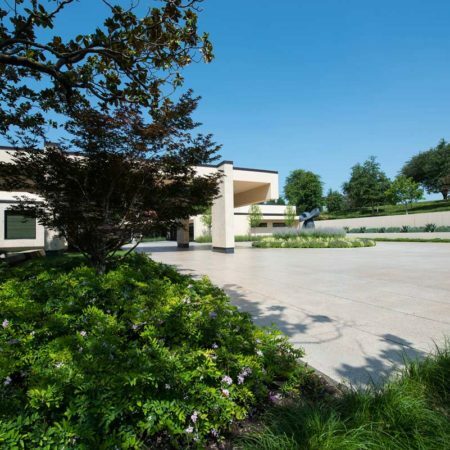 The Westover Hills project was originally designed by architect A. Quincy Jones and constructed in 1966. 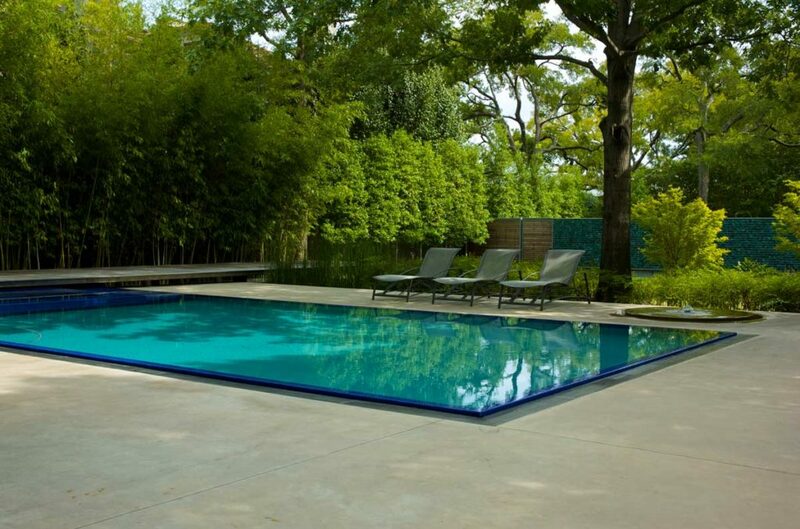 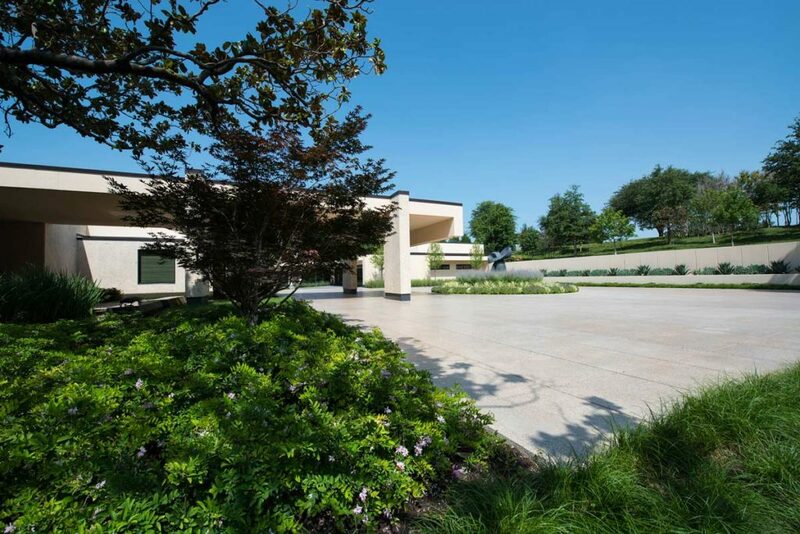 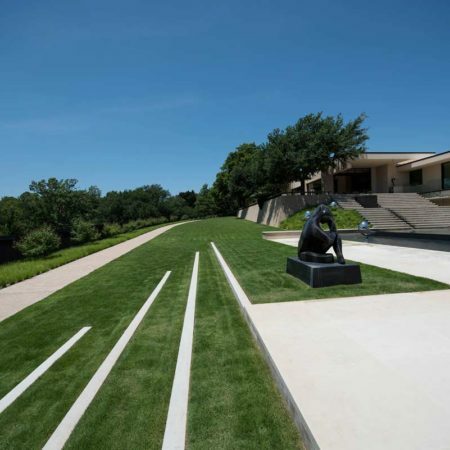 The 4-acre modernist estate is located on a stunning terraced hillside in Fort Worth. 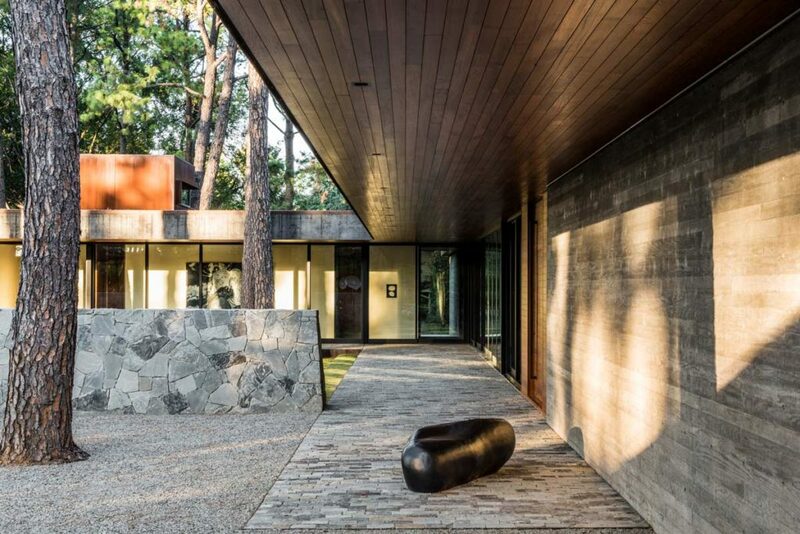 This site and home remained vacant for years until the current owner charged himself with the task of providing this jewel new luster. 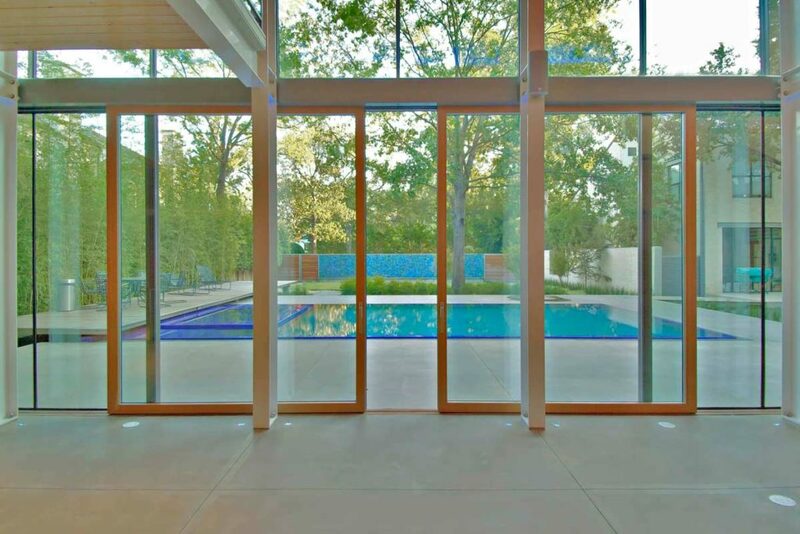 The home was meticulously renovated, and a garage and pool cabana were designed to expand the function of the existing floor plan. 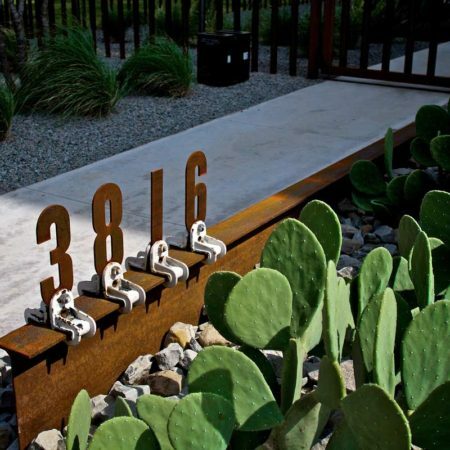 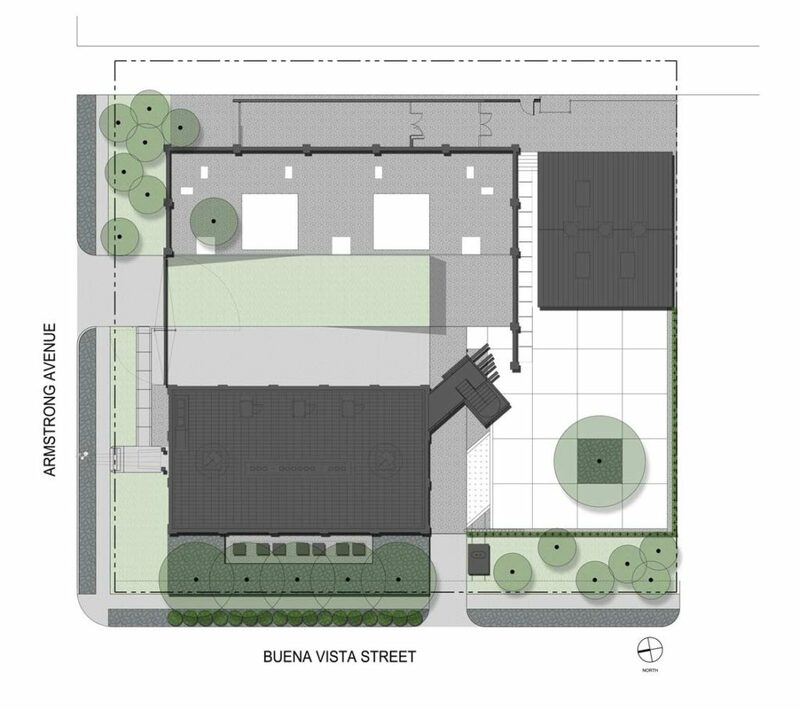 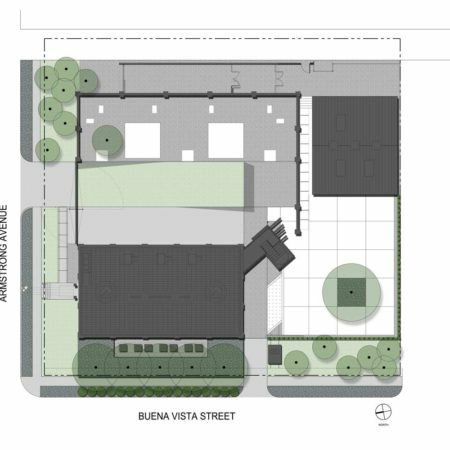 The site was reorganized around the new structures, and was reinvented with a complimentary design vocabulary. 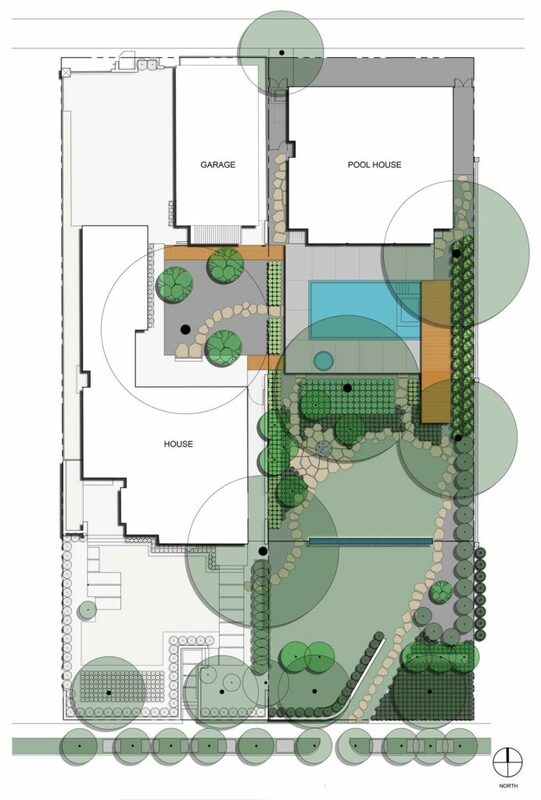 The house and garden now function as one flexible, active, and resilient space with seamless transitions between exterior and interior. 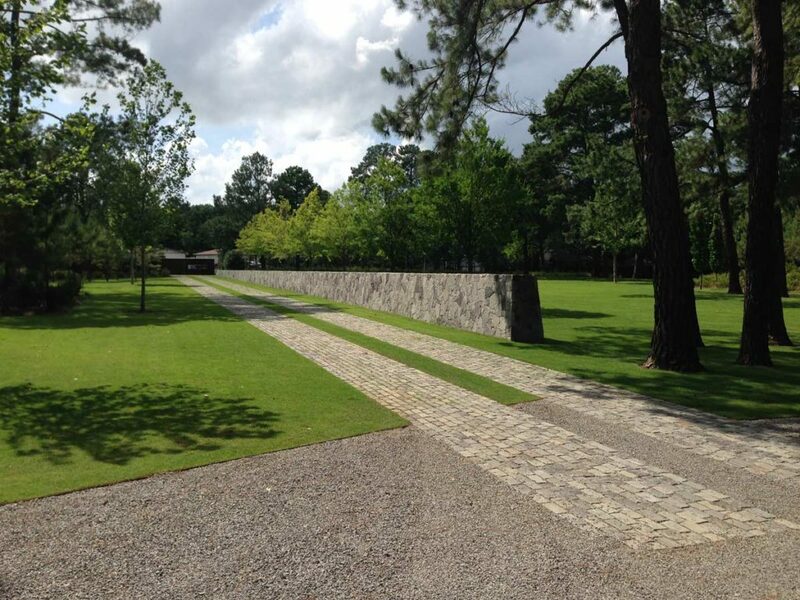 The motor court and entry garden created the first phase of the project. 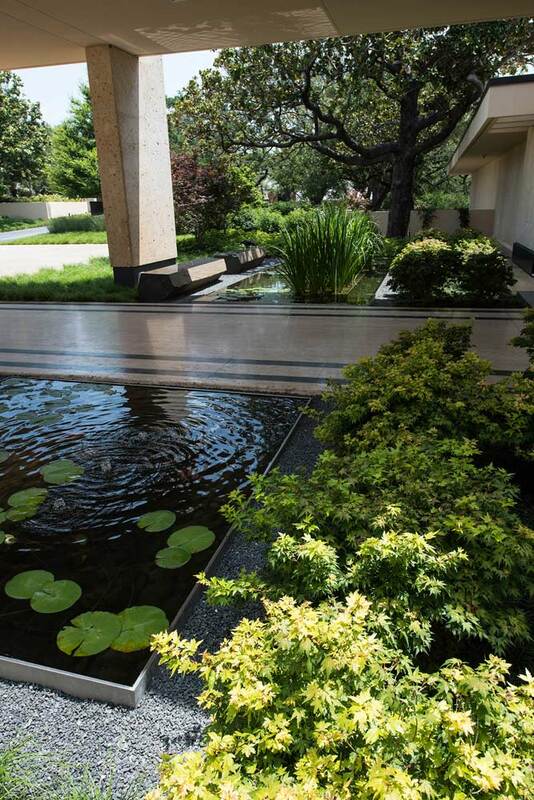 The resulting plaza showcases art, and the entry to the home presents a minimal reflecting pond extending beneath the bridged walk. 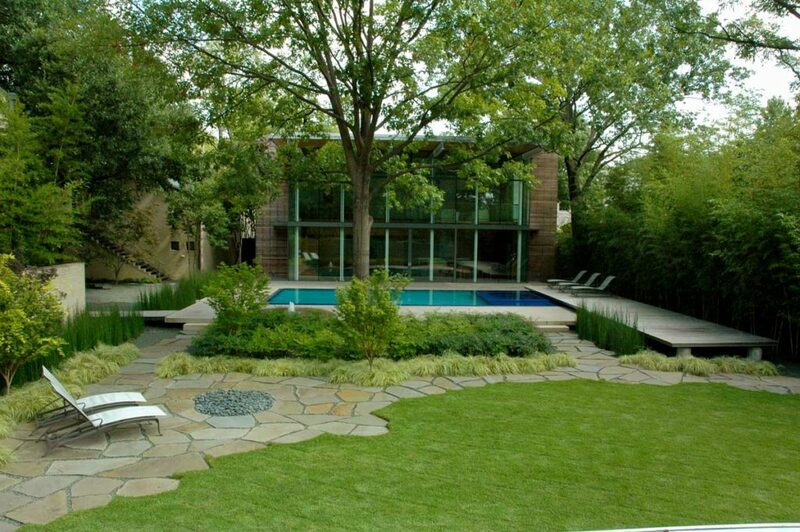 The back terrace was an existing feature of the house that was designed to extend the living space to the exterior. 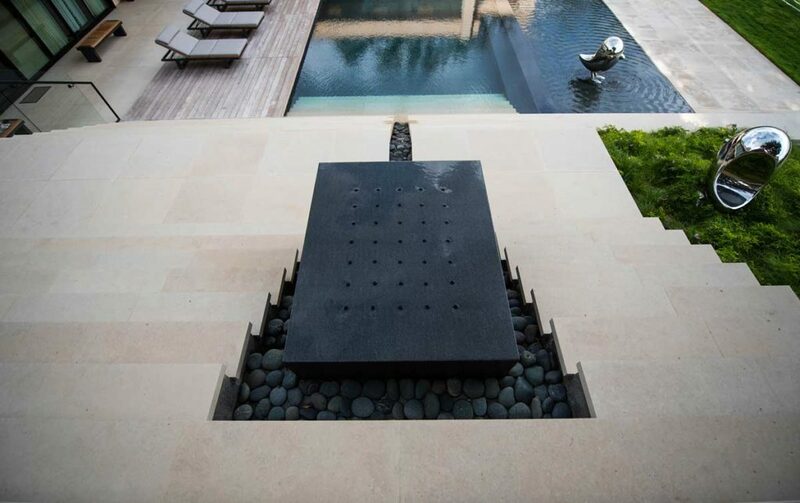 After much study and consideration, connection of the upper living and lower pool terraces became a grand architectural gesture where steps descend to the pool terrace and continue into the water. 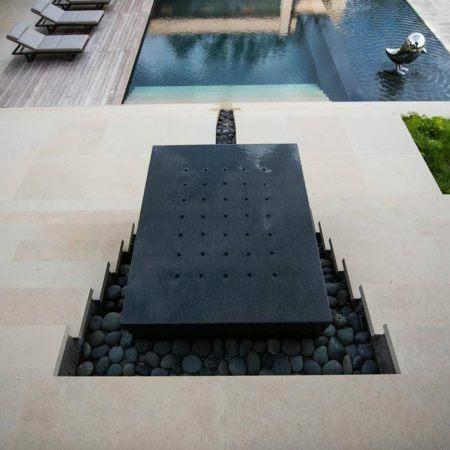 A large granite block water feature interrupts the stair to further connect the pool to the upper terrace with a classic water runnel that creates subtle white noise. 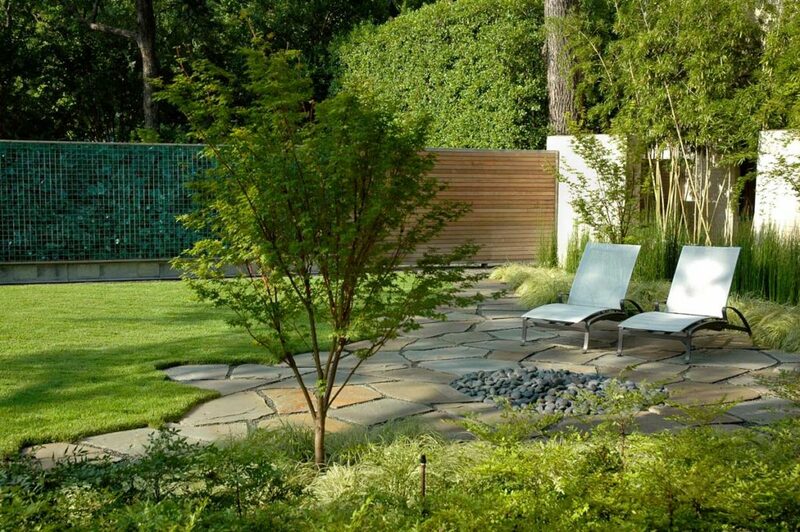 Native and adapted plantings are arranged to compliment views from the house and provide screening.